This would be a very good long term investment into renewable energy sources such as solar, especially if this system qualified for the typical California solar rebate of $6,000-$8,000. As the electricity prices continue to rise in the state, it will turn into an even better investment for the future as well. 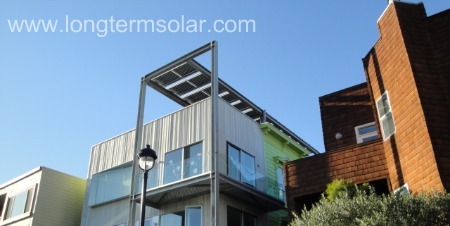 The fact that the system is mounted above the roof of the house also ensures that there is absolutely no shade to worry about blocking the solar cells.